1. Navigate to the Klaviyo website (https://www.klaviyo.com/login?next=/dashboard) and login to Klaviyo account by entering your email and password and click the green "LOGIN” button. 2. Click on the "Account" menu in the upper-right corner of your window and then select "Account" from the drop-down menu. 3. Click on the "Settings" drop-down and select "API Keys". 4. Select and copy your Public API Key. 5. Open the OCU app within your Shopify store. Click the "Settings" button from the left-side navigation menu then click "CRMs". 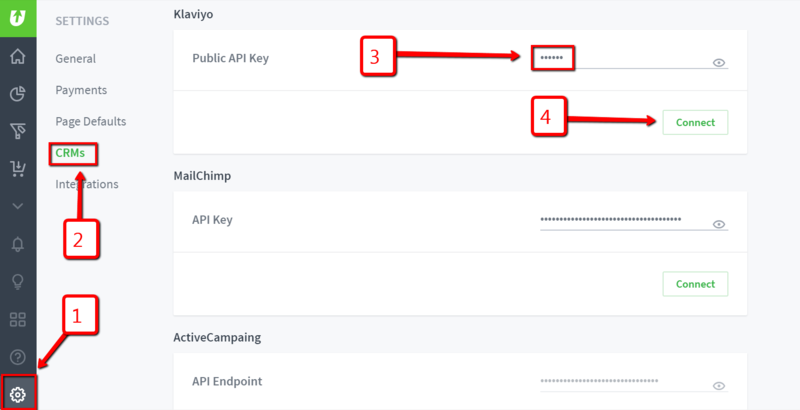 In the Klaviyo section paste your Public API Key into the "Public API Key" field. Then click the green "Connect” button. Your OCU app is now connected to your Klaviyo account via API! The OCU metrics above will only pass over to your Klaviyo account once the corresponding actions have been taken on the OCU checkout on your store. 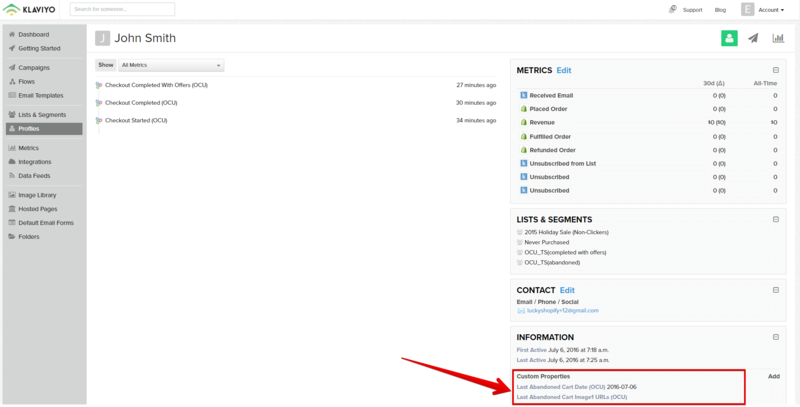 Click on "Metrics" in the left-hand sidebar. Choose "API" in the drop-down selector. Already have Klaviyo integrated with your Shopify store? If you have integrated your Klaviyo account with your Shopify store through the "Integrations" section of your Klaviyo account, then the Klaviyo app will be listed in the Apps section of your Shopify admin. In this case, the Shopify "Placed Order" and "Ordered Product" metrics will pass over to your Klaviyo account for orders that are completed on the OCU checkout as well. This means that if you already have a post-purchase flow setup that is triggered by the Shopify "Placed Order" or "Ordered Product" metric, you can use that one for OCU completed orders as well. The Shopify "Accepts Marketing" parameter will also sync over for customers that use the OCU checkout, so you wouldn't be required to use "Accepts Marketing (OCU)" as long as you have the Klaviyo app for Shopify. 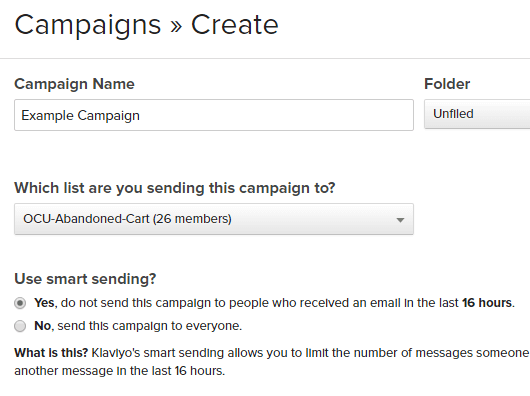 Klaviyo allows you to create both - Flows and Campaigns - using custom fields sent through the OCU Abandoned Cart feature. 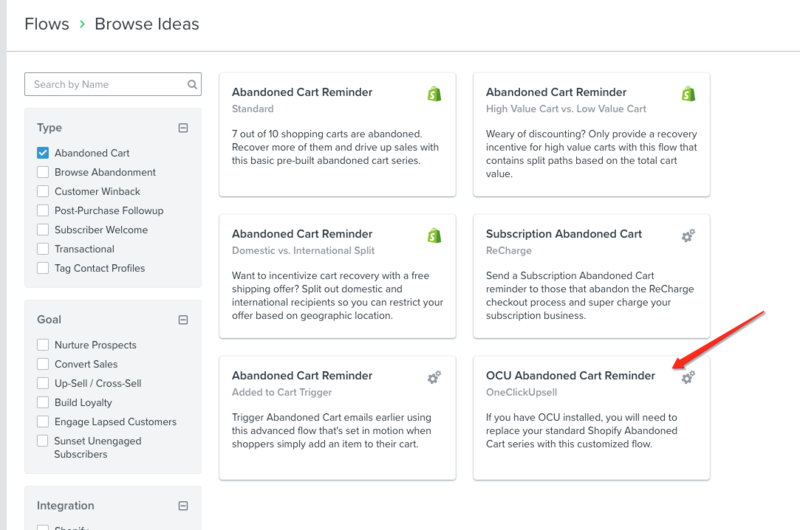 For the detailed step-by-step information on creating an Abandoned Cart Flow for OCU checkout within your Klaviyo account, please see this article! 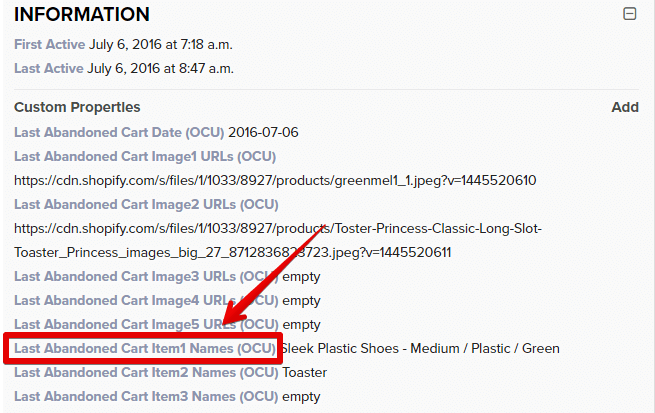 *Important: If your trigger or upsell products have emoji(s) in the title, it is recommended to remove them as they cause an issue with sending OCU metrics to Klaviyo. In order to create a Flow, you need to click on the "Flows" tab and then on the "Create Flow" button. A new window will appear where you can see a name for the Flow and choose the Trigger which will start the Flow: Subscribes to a list, Added to a segment or Takes an Action. Next, you need to pick a Trigger you're creating the Flow for. Then you're provided with a way to specify recipients for the Flow. You can choose Everyone or configure a more effective way by specifying rules. If Takes an action is selected, then select the OCU metric and then optionally select an available Dimension. Below you can see an example on how to create an auto-responder which automatically sends emails to users added to a List when specified rules are met. For our case, we need Activities which OneClickUpsell transfers into Klaviyo to be used as the Trigger. Using "AND" and "OR" operators you can create more sophisticated rules if needed. Once you've finished with the rules configuration you need to click "Create Flow" in the lower-right corner. A new window will display your rule(s) and an "Add Email to Flow" button which allows you to configure the email message itself. Clicking on the "Create Message" button will give you the ability to create an email template using the custom fields information transferred from OCU. In order to use that data you need to click on "Configure Message". Template configuration and custom fields addition are the same as for CAMPAIGNS part described below. 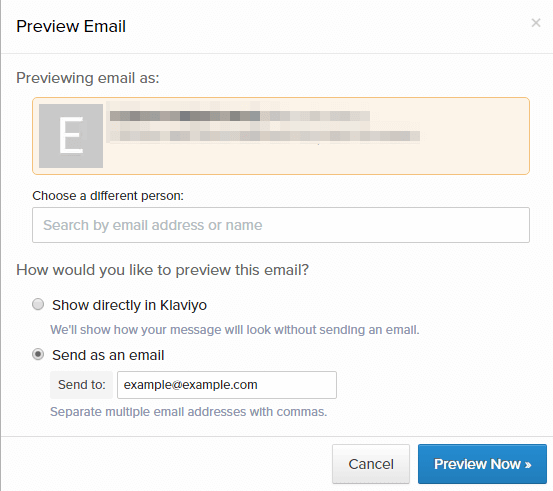 Once you've finished with the email creation you can send out a test message or preview it in Klaviyo. In order to store results, you need to click on "Save Content" in the upper-right corner. Then the Flow is created and becomes available in the appropriate tab of Klaviyo. 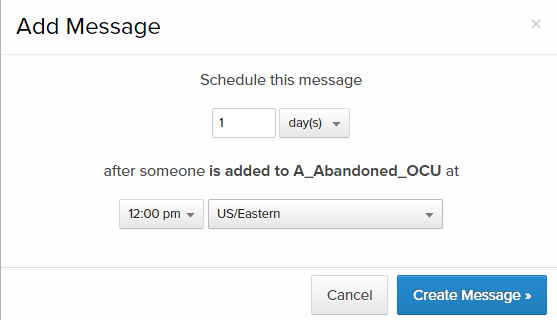 Customers who get the OCU Metrics assigned or who are added into the chosen Segment and satisfy the configured rules will receive the email messages (keep in mind the configured time interval). On the Name & Recipients step, give your campaign a name. This is separate from the subject line, so use it to help organize your campaigns. A common strategy is to name the campaign based on what the content is along with the date. Choose the segment you'll be sending this campaign to and whether or not to use smart sending. Smart sending will allow you to limit the number of emails your customers receive so that you can send targeted campaigns and not worry about sending too many emails to the same customer. The Email Content step is where you'll specify who your email is coming from, the subject line, and the content of your email. Rich HTML / Drag & Drop: Our email editor will automatically optimize your email for mobile and makes it easy to create complex email layouts that will look great on all email clients. Text Based / Simple: If you'd like to send a text only email, this is the option you're looking for. This is a good option for sending an email that looks like it came directly from you rather than your organization. Use Template from Library: If you've created a base template, newsletter template or snack template this is where you should start. You can also choose a template from the template library. HTML Editor: If you have your own HTML email template you're importing. 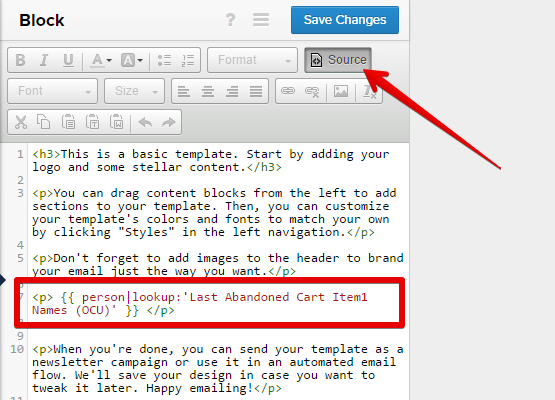 You need to pick one of the options and create an email template basing on a ready-made template or from scratch. Fields should be named the same way as they appear in the selected segment. Use apostrophes (') to mark out the field like this: 'field_name' and add "person|lookup" instruction to make this field appear in the email. In order to look for the correct field's name you can go to "Lists & Segments" -> get to needed segment and then pick the customer from there. Copy the desired field name from there and then paste it into the code when in "Source" mode. 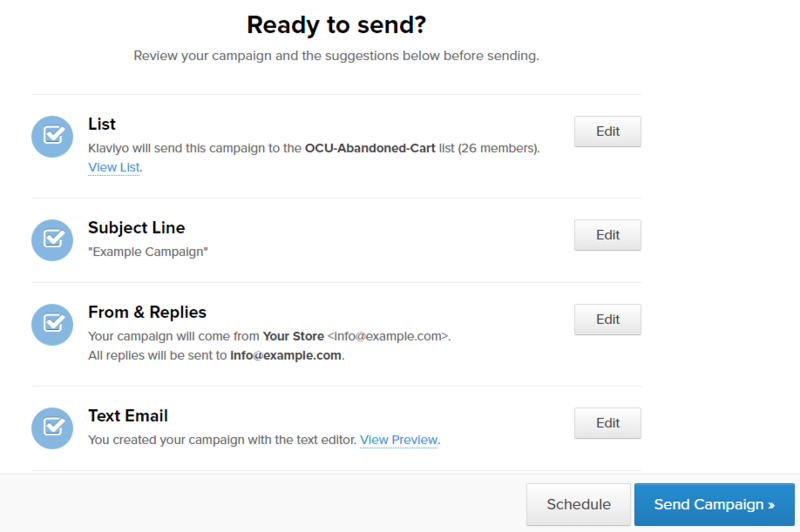 Depending on the mode, there will be preview and test sending features available which allow you to evaluate email. When all changes have been applied you need to click on the "Save" button and go to "Review & Send Campaign" step. The review interface gives a summary of who will receive your campaign as well as a few final checks to make sure you didn't leave any default content in your template or forget to add links. If you agree with all details then click on the Send Campaign button in the bottom-right corner.